Comfy fit great design great value for money too. Not too noisy in wind either. Very comfortable and good looking, very tight to get on but that results in a nice snug fit and good neck support and is glasses friendly. Have only given 4 stars though as sun visor lever is a little awkward and tight and when Pinlock insert is fitted it catches the top seal and makes opening visor awkward. 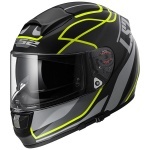 Could do with being recessed into visor at top as it is along the bottom. 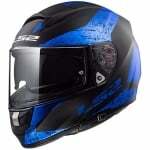 Apart from that it is a good helmet, comfortable and very little wind noise. Helmet came in a super quick time and has lived up to my expectations so far. No complaints. Very light, well build and with excellent looks, this helmet had everything I was looking for. But the ventilation on this helmet is a joke, and makes if fog so badly that even with the Pinlock it will fog up quickly. I had to remove the breath deflector as I wear prescription glasses and my breath was directed to them and completely fog up in a matter of seconds. I had to stop the motorcycle because I could not see anything. A very smart looking helmet, I was pleased with the plush lining. It is quite hard to get on my head but once on it a very comfortable fit. It feels much lighter than my old full face. 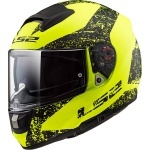 The quality is really good but I do have a problem; when the Pinlock insert is fitted it catches on the helmet top seal when you try to open the visor, I was worried that it would dislodge the Pinlock, but it's fine, for the moment at least, hence 4 stars. Unfortunately I am not permitted to upload a picture illustrating this issue. Nothing but good words for this Helmet. Build quality is great, it's light weight and feels great.